I like to start Mondays with something exceptionally cheery, because Monday’s always get a bad rap! How many times in your life have you heard, “I hate Mondays,” or “Ugh. It’s Monday again,” or something to that effect? I have to admit, I’m the opposite. I’m slightly mad for Mondays. I look forward to Monday the way most people look forward to Friday. I love Monday! To me, Mondays always feels like a gift – a fresh start, the beginning of a new week, the perfect time to map out plans, set short-term goals, and make mini-resolutions. Not that I always accomplish what I hope to accomplish during my sometimes overly-optimistic Monday Musings. Not that I always stick to every plan, every resolution. Not that the week never falls apart due to unexpected circumstances. But on the bright side – another Monday morning is just around the corner! Yep. That’s how I see Mondays. But just in case your approach to Monday might be a little different, here’s a bit of embroidery to cheer you up and start your week out right! And not only are they daisies, but they are exquisitely embroidered, little daisies. This is a project from Trish Burr’s book, Miniature Needle Painting, which I reviewed here. 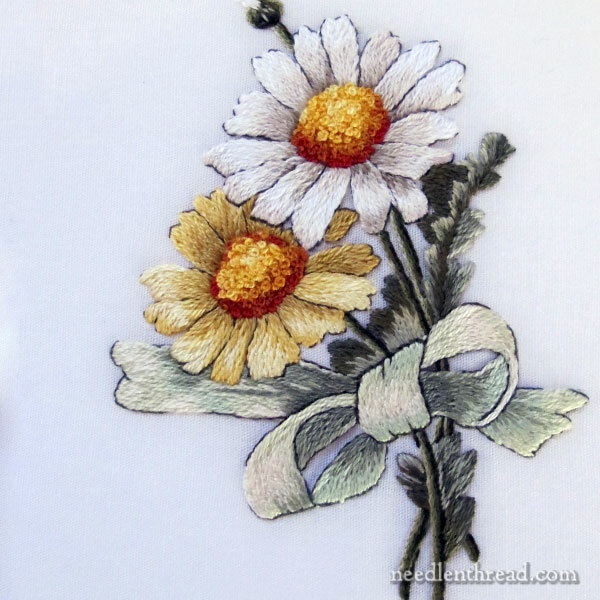 These particular daisies were mighty skillfully stitched by my friend Cindy Russell, whom you might remember compiled my Marian Medallion series into a gorgeous e-book. I’m absolutely in love with the shading on these flowers – from the centers with the French knots (which add great texture), to each little petal, to the tiny shadow here and there around the petal. To give you a sense of the size of the project, I took a photo with my hand in it. 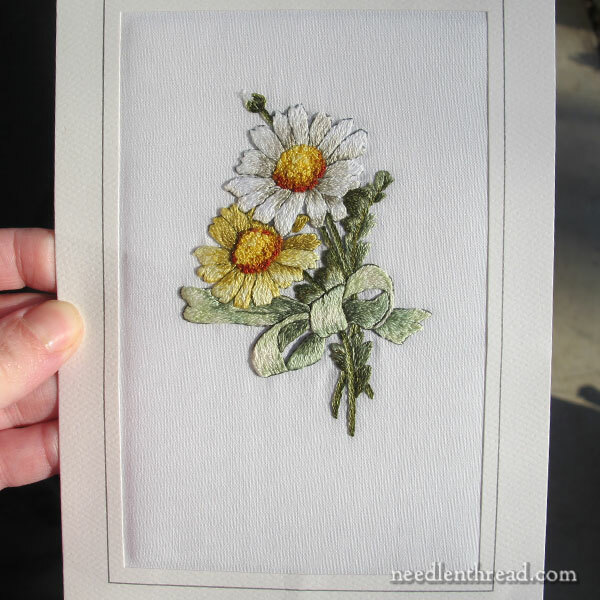 Cindy finished the daisies into a lovely card. To finish the card, she used a piece of interfacing behind the embroidery, cut to fit the window of the card, which gives a little lift to the embroidery so that it protrudes just slightly from the cut window. This technique makes the card look perfectly professionally finished. I hope you’re having a terrific Monday so far! If not, don’t worry. As Pollyanna would say, there are seven whole days before you have to face it again! Oh, lovely daisies! I love the shading on this whole project. Thanks for sharing, Mary. The card is a certainly a beautiful Monday inspiration. What a lovely piece of embroidery so beautifully stitched, I love the shading on the leaves and the daises are beautiful as well, I just want to stroke them they look so real and what a lovely card to have which you deserve Mary. Well done Cindy an exquisite piece of embroidery. 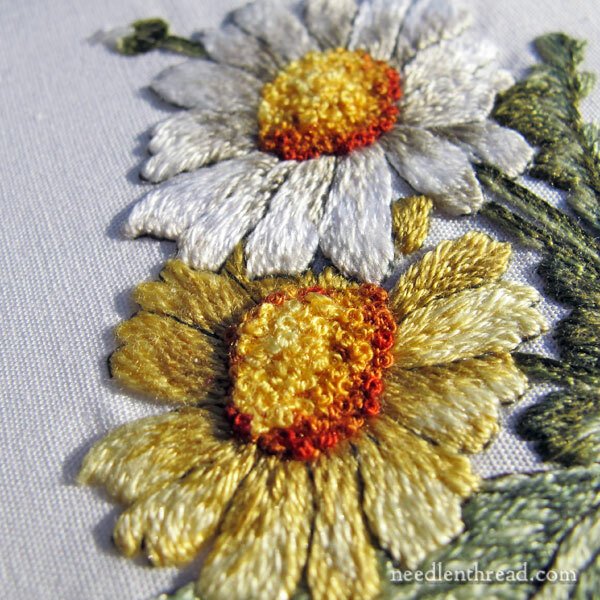 Thanks so much for sharing the embroidered daises a cheery start to the week. Thank you for your chippery Monday morning post! A perfect start to my week. I believe the quote is from Anne of Green Gables by L.M. Montgomery – yes? I love Mondays! and daisies. I have a shop that is open every weekend so Monday is like my day of rest and my “weekend.” And Daisies are so cheerful. Thanks for sharing! I recognized Trish Burr’s distinctive, high contrast style right away! It is interesting that the style stays true, no matter who has stitched the piece. Does Trish specify which threads to use? Hi, Monica – yes, the instructions are in her book, and each project has a color list. Hope that helps! The movie was You’ve Got Mail. Meg Ryan and Tom Hanks. Lovely little movie to stitch by. Oh My! A lady after my own heart. I love Mondays for the very same reasons and how did you know, daisies have always been my favorite flower. Thanks, Mary. What a perfect note today for a new week. Lovely daisies! And I think the quote is from “You’ve Got Mail!” My favorite part of the movie–the last 20 minutes. Next Next post: Bead Embroidery – Online Class – Just in Time!